I have a 4th grader this year. I’m still not quite over the fact that she is growing up and is so mature for her age. However, one of the perks to this growing up thing is that she can work independently in a few subjects. I never thought this day would come, but I’m seeing hope for the future! 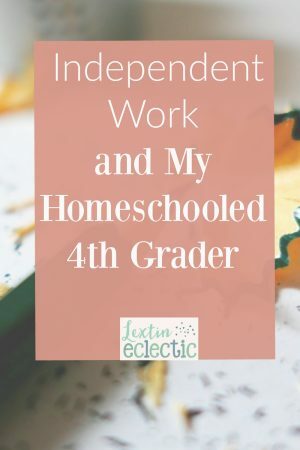 Before I talk about how wonderful an independent learning can be, let me first talk about why I don’t push my kids to work independently at a young age. I don’t think that early elementary kids can do much homeschool work on their own. You can try to give them books to read, math pages to do, or online lessons to complete. I’ve tried a variety of ways to get my kids to do any subject without me sitting right next to them. All of my careful plans backfired. My kids cannot work independently until they are older. Why? If I give them anything to do they will spend their entire time daydreaming or being distracted. I end up wasting more time redirecting them to complete a single piece of paper than I would have spent if I just sat next to them the entire time. Also, when my kids have completed something without me sitting nearby, the quality of their work is, well, basically terrible. It’s amazing how many math problems they can miss through silly errors or how sloppy their handwriting becomes the instant I’m out of range. So, to save time and my sanity I sit with my kids as they do their work. I encourage, correct, and redirect as we do our school subjects together. However, know that there is hope! I’ve seen that as a 4th grader, my daughter can do some work on her own. She has been able to take responsibility for completing a short checklist of school items without me sitting right next to her or even being in the room with her. She is starting to work independently, do quality work, and be responsible enough to complete her assignments without too many reminders. How do I encourage independent learning? I give her a short checklist at the end of our school time together. I make this new list every. single. day. I check over that list with her at the end of every day. Did I mention that this is a daily thing? Yes, she’s not ready for a weekly check or weekly assignments. I have to be diligent daily to check up on her work. Throughout the day I glance at the work she’s doing to make sure she’s on task and that her work looks complete. I also ask her accountability questions during the day to check her progress. I ask what she’s working on, how much more she has, how her work is going, and if she has questions. I give her tips for how to manage her time – such as suggesting what order she should work on her subjects. These ideas are presented as suggestions only and she is free to find her own rhythm for her school day. But I try to help as much as possible. During the day I give gentle reminders such as, “I will be reading to Tiger for 30 minutes so that would be a good quiet time for you to get your reading done.” I’m not telling her she has to do her work during this time, I’m just pointing out each opportunity that she has to complete her work. We review her list at the end of the day and go over any questions she has and I glance through her work. At the end of the day, if her list is not complete, she can’t complain to me that she didn’t have time as I gave her many reminders and opportunities to sneak in her work. So, she’s working independently but with much direction and many reminders from me. My goal is to push her toward responsible independent learning but I want to make sure she is equipped for the task. By giving her reminders, suggestions, tips, and asking accountability questions, it has helped her become a good manager of her own schedule. What does she complete independently? She works on a Spanish program on the iPad every day to practice vocabulary. She completes her writing lessons independently after I give her instructions and teach the lesson. The next day we review and edit her work together. She finishes her math pages on her own after I’ve taught her the lesson and given her a few practice problems. We then review her work the next day before our new lesson. She does problems from her logic workbook on her own. She completes the questions in her Bible workbook after we have read the lesson together. She does her history lessons online without my oversight (we still read through our history text together). So, she’s not doing many things completely on her own. I still choose to do most of our subjects together and slowly give her some independent work. Next year I plan to increase the amount of work she does independently and still have daily check-ins with her as she works. One day I hope to be able to move to weekly checklists and many more independent learning opportunities.